Turn-in days are always sad. This one was just sad in a different way. CCI’s veterinary technician called me several times this week. On Tuesday, she reported that Dionne was still dripping blood, and under the microscope, her cells confirmed that she was still very much in heat. On Wednesday, Melissa saw little change, but she pointed that things could turn around overnight. Now we won’t get any official report until July. Worse still, unless Dionne graduates in November, we could wind up never seeing her again. That feels sadder than sad. It’s always satisfying to get feedback about science experiments in which one participates. We’ve just gotten some from the folks at Dognition. That’s the company/website set up by the Duke University anthropologist who specializes in canine behavior research. 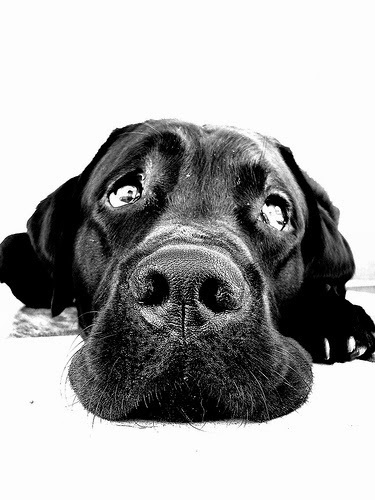 I’d read about him and his work in the New York times about a year ago and was very excited when we learned last July that CCI had formed a partnership with Dognition, so CCI puppy-raisers would be able to participate for free, instead of paying the normal $99 fee. We signed up, and last July Steve and I administered all the science-based games to Dionne to assess her empathy, communication skills, cunning, memory, and reasoning.We quickly got her assessment: of the 9 profiles types, she fell into the category of Charmer, the Dognition site informed us — gifted with “exceptional social skills.” She literally scored off the chart for memory, and her performance in the “Empathy” section also was extraordinary. “If most dogs are bonded to their owners, Dionne absolutely adores you,” the report informed us. 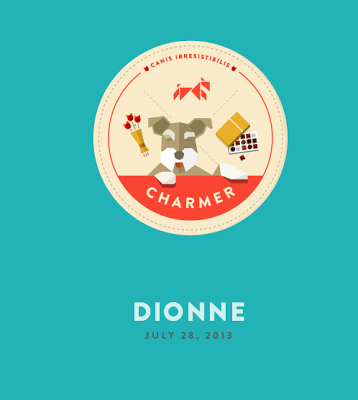 I’m a little confused by what it means that Dionne was a Charmer, rather than a Socialite or Protodog. Will it make her do better or worse in her Advanced Training? But we’re generally in the dark about Dionne at the moment, since she’s still in the kennels because of being in heat. I did hear from the puppy program manager that the vet tech will begin testing Dionne to see if she can come home for a brief spell before the ceremony this Friday.